Paddan - The small boats in the canals in Gothenburg, Sweden. Christmas Paddan to Liseberg. 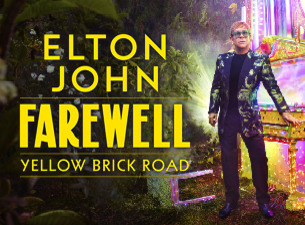 Season 2019: 12 april - 13 oct.
Hop-on / Hop off: End of jun - middle aug. Christmas 2019: 23 Nov - 23 Dec. If you do not have time to travel by boat out to the island Vinga or take a trip to Marstrand. 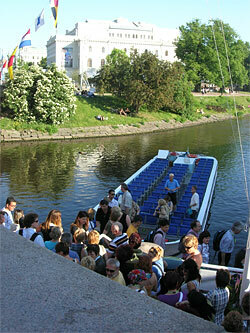 Why not go on a tour in the characteristic flat Paddan boats that departs from the city centre. It is a nice trip in the canals around Gothenburg... and do not forget to watch your head when going under the bridges. The flat boats are waiting for you at the small dock at the Kungsports Bridge (Kungsportsbron). A guide will accompany the boat ride and try to tell you the whole story about Gothenburg, apart from Swedish also in English and German. Every boat takes approx 90 people. June 15, 1939 the first trip with Paddan departed with paid passengers. At this time it departed from the east side of Kungsportsbron, where the station at this time were located. The boat operated on petrol and could only take 12 people. At this time passengers could also hop on along the way. During the war the petrol became very expensive and people didn´t afford to go with the boats. It was time to event something else - the first gas driven boat arrived year 1941. Time passed and in 1942 Paddan got hold of the first big boat that could take over 80 persons. After this year Paddan nearly increased its fleet with new boats every year. Today there is only one boat left since the 40´s. The trip with Paddan along the canals and out in Göta Älv takes approx 50 minutes. 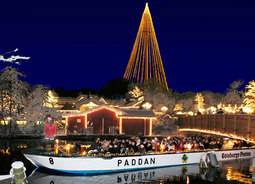 At Christmas time you can take a trip with Paddan to Liseberg. Then you can enjoy your coffee and the Swedish drink "glögg" with a blanket on your knees. You can also take the boat back to town if you want. 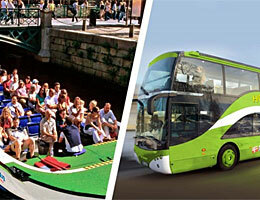 Now you can go by Paddan hop-on/hop-off tour. You buy a ticket for 24 hours and then jump on and off as you want at specific stops as Kungsportsplatsen, Lejontrappan, Lilla Bommen and Feskekyrkan. 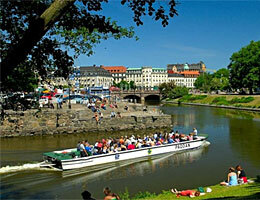 The flat Paddan boats will take you through the canals of Gothenburg and out on the Göta Älv. Gothenburg is celebrating 400 years in 2021 so you will here about a lot of history and see many nice buildings, parks and ships. 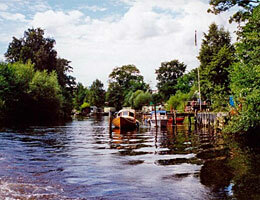 If you haven´t been on a Paddan boat before we would really recommend it. We have traveled several times both with friends and on our own because it is a really nice exeperience. At first no one believed in this idea, to go by boat around Gothenburg. It was the newspaper seller Lars Andersson at Kungsportsbron that first came up with the idea with small boats in the canal. Sorry to say he didn´t get any attention for his idea and finally it became Gundel Matsson who operated a travel agency in town, who realized the idea. Certainly it later became a big success for the city, today the small flat boats is a distinguishing feature for Gothenburg. In 2009 Paddan celebrated 70 years. During Christmas you can go with Paddan to Liseberg. A cozy little tour wrapped in blankets and with Swedish glögg (mulled wine) to drink. During Christmas Liseberg is usually open in mid-November until the last days of December. 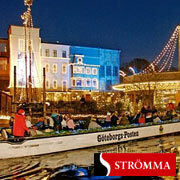 A winter sightseeing tour with Paddan to Christmas at Liseberg and admission is included in the price. Before the trip you are served mulled wine and gingerbread. 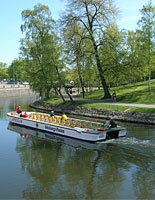 The boat departs from Kungsportsplatsen. 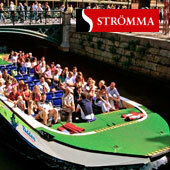 The tour is presented together with Strömma.